Last week I wrote about how I crossed one item off my video game “bucket list,” completing The Lion King. But last week actually had me cross something else off as well. The same used video game store had another precious game from my childhood, probably more precious than The Lion King. I innocently browsed the GameCube section of the store, glancing at such classics as Luigi’s Mansion and Zelda: Wind Waker, when I did a double take. There, not where it should be in alphabetical order, almost winking up at me, was a copy of Skies of Arcadia: Legends. My friend who was with me can back me up on this—I squealed. I grabbed the copy of the game off the shelf and raced to the counter, clutching it to my chest like it was made of gold. Really, it might as well have been. You see, Skies of Arcadia and I have an interesting history. We met back in the early 2000s, back when I was an awkward tween who thought 3D graphics were the best ever and that there was no such thing as a bad Sonic the Hedgehog game. I knew very little about role-playing games, outside of the fact that they often had “boring” turn-based battle systems and random encounters. I had played Pokemon, but that was as far as I was willing to go. I also had no job, and relied on my parents for my video game income. For obvious reasons, they didn’t like spending 60 dollars more than a few times a year on a game, so I ended up getting a lot of the games I played from a tiny BlockBuster down the street from my house, wedged between a supermarket and an Italian restaurant. I had only a GameCube, and that had the smallest section of video games for rent. So, it was slim pickings. While browsing, a certain game caught my eye. It had an anime boy (I knew next to nothing about anime as well at this time—I was in an awkward phase of trying to convince myself I wasn’t a nerd) on the cover holding a sword with flying ships in the background. I picked it up, flipped it over, and read the back of the box. This game promised action, adventure, big ship battles and a good story! It sounded awesome! I asked my mom if I could rent it, and she said I could. I took it home, plopped my little brother on the couch next to me (who didn’t play many games yet), and popped the game in. 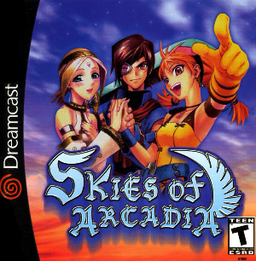 This game, of course, was Skies of Arcadia: Legends. I remember being taken in immediately from the start. The introduction still sticks me, even now. A lone woman flying a funny looking narrow ship, getting captured by a pompous douchebag. The team of Sky Pirates raiding the ship. Vyse and Aika leaping into battle. I remember being disappointed that the battle system was turn-based. I also remember knowing that this game was in my possession for the next five days (my parents would never be caught dead having a late fee), and that I was stuck with it. I remember being immensely curious about what happened next. I remember deciding that I could see what a turn-based game was like. I remember being completely hooked. Riveting stuff. Everyone moves, constantly! Skies of Arcadia: Legends sunk its hooks firmly into me. It captured my imagination at a time when I was struggling to determine what I really enjoyed. Here was a world full of adventure, of character, of life and story. It felt more real than any of the worlds I had experienced on the Sega Genesis. It felt big, it begged to be explored. It rewarded me for my patience, encouraged me to seek out what was there. It also had to be returned far too soon. I had to go to school, and of course, I rented the game on a Sunday so it had to go back Friday. My parents wanted me to be more active, so I was involved in an after-school Karate program. I did not have the time to finish this wonderful game. And I couldn’t rent it again, not right away. I returned it on Friday, and it was checked out that following Sunday. It wasn’t fair! I needed this game more than I needed anything else! And I needed it now! Being the clever boy that I was, I did my research. I found out that Skies of Arcadia: Legends was actually a port of a Dreamcast game simply titled Skies of Arcadia. I had a Dreamcast. An EBGames near my house had one copy of Skies of Arcadia for far cheaper than the GameCube version. I begged and pleaded with my mom, and managed to get her to take me to that EGGames, where we spent the better part of an afternoon looking for that one copy. It, of course, was filed under the V’s. But we found it, bought it, and all but rushed home. I knew I had to start the game over, but I didn’t care. I was more than willing to go through it all again, to re-experience everything. I like this box art more. I got home, popped the dusty Dreamcast open, and stuck Disk One in. It worked. You see, the game started fine. Played well enough to pass EBGames’s incredibly stringent “Pop-it-in-and-see-if-it-works” test. But once you got to a certain point, it froze. Crashed. Would attempt to load a random battle and never get there. You name it. You would think I’d be crushed. No, you see, I got determined. My dad had an old CD cleaning kit that I dug out. I cleaned the disk obsessively. I cleaned the Dreamcast reader. I read directions on how to remove scratches. I put everything I had into getting this damn disk to work. Through a lot of cleaning, a lot of saving, and more than a few times of crushed hopes, I managed to get through the scratched disk. See, I would save constantly when I could, and attempt to play through a section. If it crashed, I turned off the Dreamcast, cleaned everything, and started again. More often than not, I could progress to another save point before another crash. I repeated this process God knows how many times, but my determination paid off. I was able to get through Disk One. I was able to complete Skies of Arcadia. Getting through this game was a labor of love. I wanted nothing more than to see the ending. Sometimes, it felt like I was fighting against the disk itself to play this game, but I kept at it. I just kept at it. It actually works! Kind of. Fast-forward several years, and I still have that EBGames copy of Skies of Arcadia. But I am afraid to ever try to play it again, because that would mean risking constant crashes. I have even less time to game these days, and dealing with that headache seemed like exactly that. But I wanted to play Skies of Arcadia again. I wanted to own a working copy. And no, I didn’t want to pirate it. A game I loved this much deserved a physical copy. But unfortunately, physical copies of the game are very very expensive. During college, I could never justify to myself paying over a hundred dollars for a copy of a game I already technically own, especially when there were so many other games to play. Now, however, I have an adult job with an adult paycheck. But to be honest, Skies of Arcadia had moved more toward the back of my mind. It became fond memories, rather than something to seek out. I always checked for a copy of it at gamestop or any other games’ store, but always turned up empty handed. I have it. It works. And I think it’s time to re-experience it. That is, after I finish Fire Emblem: Awakening.